“This latest order demonstrates how satisfied Stadler has been with Kiepe Electric systems,” comments Dr. Jürgen Wilder, member of the Executive Board of Knorr-Bremse AG and responsible for the Rail Vehicle Systems division. 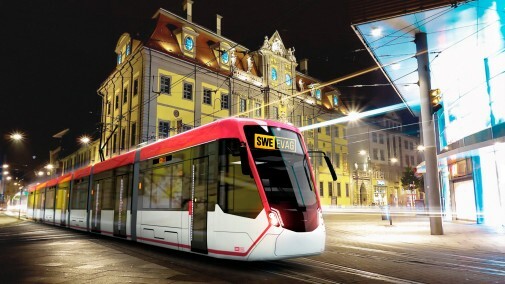 Tramlink low-floor vehicles built by Stadler and equipped by Kiepe Electric have already proved extremely popular in cities like Rostock, Germany and Gmunden, Upper Austria. “So the order is just the latest in a long line of successful collaborations between Kiepe Electric and Stadler.” In addition to the confirmed order for 14 seven-car LRVs, the Erfurt transport authority has also taken out options on a further 10. According to Dr. Heiko Asum, Managing Director of Kiepe Electric, the systems make up a comprehensive Tramlink package: “In addition to the complete traction kit and on-board power supply, we are also supplying the vehicle control system, including hard and software, HVAC systems for the driver’s cab and passenger compartment, on-board and external displays and the video monitoring system. The control panels and operating and display systems in the driver’s cab also come from Düsseldorf.” This means that, Stadler is being supplied from a single source with a whole range of perfectly-matched systems and functions tailored to the Tramlink platform. Modern equipment from Kiepe Electric requires little maintenance and offers enhanced energy efficiency. For example, waste heat from the water-cooled motors is transferred via a heat-exchanger to the passenger compartment. And the demand-controlled HVAC system is equipped with a CO2 sensor that continuously measures air quality and ensures a supply of warm or cool air based on the number of passengers on board. Regenerative braking energy is either used by the vehicle itself or fed back into the overhead line. Each Tramlink vehicle is 42 meters long and can accommodate 248 passengers. Built and commissioned at the Stadler facility in Valencia, Spain, the LRVs will be rolled out on the Erfurt network from 2020 onwards. This means, for example, that in April 2021, visitors to the Federal Horticulture Show (Bundesgartenschau) in Erfurt will be able to experience traveling on the new vehicles. 46.79% of the purchase cost of the Tramlink vehicles is being met by the European Regional Development Fund (ERDF) and the free state of Thuringia.